The robot has come one shuffle step closer to becoming an aid to its human counterparts. The scientific explorers in robotics led by Dr. Koeda take a series of shuffle steps for mankind. Professor Masanao Koeda affiliated with Ritsumeikan University has developed a robot measuring nearly 20 inches that can shuffle its feet, twist and bend. The robot can make a 90° turn without taking its feet off the ground. According to Digital World Tokyo, this breakthrough will allow future robots ease in motion without losing balance and falling. Currently, two legged robots must perform a circular turn likened to an oil tanker to change course. 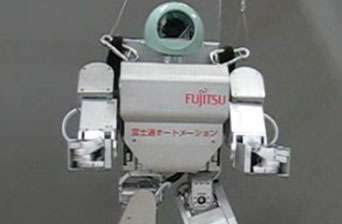 A video of the robot performing the "Koeda Shuffle," is available here. The significance of this advancement is that the shuffling action will allow robots in the future to maintain balance while carrying objects in its arm-like extensions. The ability to shuffle its feet in one spot and make a turn is a major achievement that holds significant potential for the utility of future robots. The current method requiring the robot to lift one foot and in rapid succession balance on one foot to perform a change in direction can impede balance. It is difficult for the robot to perform arduous turns and hold objects in its hands. The shuffling action of the Koeda Robot allows the robot to change directions without having to pick up it feet in the process. This factor allows increased balance and smooth, non-jerking motions which will afford the robot greater agility carrying objects while in motion. The accomplishments of Dr. Koeda in collaboration with T. Yoshikawa and K. Nakagawa and others in the field of robotics has achieved scientific recognition. Recently an abstract on "Stability Improvement Using Soft Sole on Humanoid Robot" was presented at The 9th International Conference on Climbing and Walking Robots. Other noteworthy scientific abstracts include, "Grasping and Manipulation by Soft Fingered Robot Hands," and "A Quantitative Evaluation Method of Handiness Using Haptic Virtual Reality Technology." Professor Koeda has an impressive scientific background in the field of robotics, communications and innovations in unmanned helicopters used in assessing damage in natural disasters. His collaborative efforts in this area was conducted for the United Nations World Conference on Disaster Reduction. His current work on the prototype shuffling, twisting and turning robot is a logical extension of his scientific endeavors. The future of the agile humanoid robot include modifications that will allow it to move on rough surfaces and sloped land areas. The ultimate future of the humanoid robot may include the role of caretaker for severely disabled or wheel chair bound human counterparts. The range of duties and tasks the Koeda Robot may handle in the future is by all estimates up to the imagination of the Koeda team of scientific explorers. For a complete list of Dr. Koeda et.al publications see: http://robot.ci.ritsumei.ac.jp/~koeda/. This article was translated from this source. He is currently in Brazil on a lecture tour.